SAN DIEGO — And then there were two. Six submissions for a hotel development project on Harbor Island were whittled to two on April 14. One project proposed to build a 200-300 room “Boat-el” and a canal for kayakers, paddleboarders and users of other small watercraft. The second proposal focused on adding three medium-sized hotels, an urban beach, and office space for Harbor Patrol officers and Port of San Diego officials. The Port of San Diego Board of Port Commissioners selected Oliver McMillan Inc. and Sunroad Enterprises as the finalists to bring a brand new hotel project amidst nearby marinas. Oliver McMillan and Sunroad Enterprises both proposed a large hotel project to be built on 57 acres of designated land and water and will now have to provide the Board of Port Commissioners with expanded details of how their respective proposals would be realized. The Oliver McMillan proposal was more recreationally inclined and featured a “Boat-el” and small watercraft canal. Sunroad Enterprises’ was a little more straightforward, focusing on the Port of San Diego’s ambitions to promote Blue Economy project and research. Commissioner Bob Nelson said he preferred solely moving forward with the Oliver McMillan proposal, adding the Sunroad Enterprises proposal lacked depth and thought. Nelson added his colleagues need to make sure whoever they ultimately select should make sure the final project is consistent with California’s Public Trust Doctrine. Commissioners, in a 5-1 vote, also encouraged either company, if selected, to partner with one of the firms – Topgolf International Inc. – not selected to the shortlist. “Topgolf could be an exciting addition to Harbor Island but should be sited and developed within the context of a comprehensive master plan,” port staff said of the Topgolf proposal, which would have built hitting bays, a rooftop terrace, full service bar and restaurant with a lounge and pool tables. Commissioner Gerry Bonelli voted against the recommendation because he did not believe having a hitting bay was the right use for the Harbor Island redevelopment project. In all six firms responded to a Port of San Diego proposal request for the planned development of a hotel project on 57 acres of land on Harbor Island, which are both a boater’s destination and a waterfront neighborhood adjacent to San Diego International Airport. Three of the firms – Tripp Development, Pacific Coast Historical Dinner Show and Janez Properties Inc. – did not advance to the final round of consideration because their applications were incomplete, failed to identify financial partners, or fell short of explaining how its vision would be executed. The most ambitious proposal was submitted by Oliver McMillan, who proposed two 500- to 750-room hotels, a “Boat-el” venue, recreational watercraft canals, a seaplane, view corridors, plazas and open spaces, piers, urban sidewalks and an area for hospitality, blue technology, retail, public market, office use, restaurants and marine services. Oliver McMillan anticipates spending between $760 million and $1.2 billion on executing its proposal. Sunroad Enterprises’ pitched building two 175-room hotels and one 150-room hotel, office space for Harbor Police and port officials, a park and urban beach, infrastructure promoting Blue Economy, and restaurants. The family-owned business, which is already on Harbor Island, anticipates investing up to $300 million on the project. How each proposal would affect the surrounding marinas were not detailed in the staff report. Details of each proposal are still being fleshed out since the port only requested broad pitches from each firm. Another major issue is access. Sunroad Enterprises pursued its hotel development project on local tidelands as recently as 2015 but the California Coastal Commission rebuffed its proposal last summer. The proposed hotel project did not include enough affordable lodging along the water, commissioners stated in their rejection last year. Whether the Sunroad Enterprises or Oliver McMillan proposal would pass muster under the Coastal Commission’s post-Charles Lester regime remains to be seen. 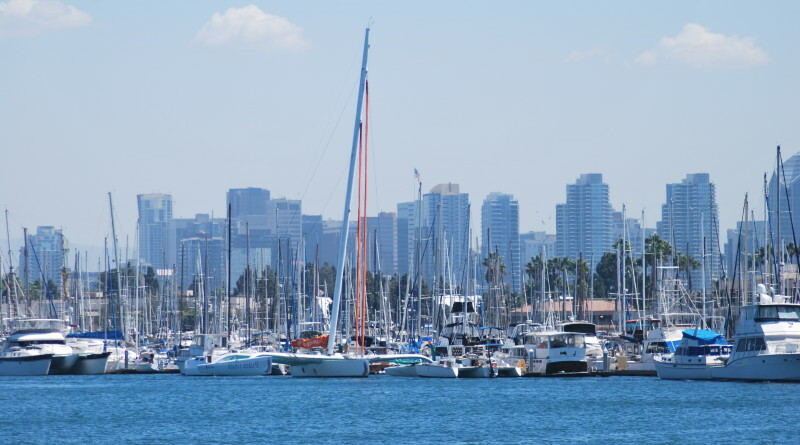 Harbor Island is home to Sunroad Resort, Sheraton San Diego, Cabrillo Isle, Marina Cortez, and Harbor Island West marinas. The Port of San Diego anticipates hosting a town hall meeting in May to solicit stakeholder feedback on the Oliver McMillan and Sunroad Enterprises proposals. Both firms will be issued a supplemental information request in June, to explain how their respective projects would fit within the Port’s planning framework and provide detailed budgets. A master developer could be selected as early as August. All three companies in the running – Oliver McMillan, Sunroad Enterprises and Topgolf – gave brief presentations to the board of how their respective proposals would benefit the San Diego waterfront. Greg Murphy of Maritime Alliance said the Blue Economy supports about 46,000 jobs in the San Diego area.